Banksy’s art has struck a chord with a huge group of people. They span generations and socioeconomic barriers. They are from all countries, all professions, and all walks of life. The one unifying factor is their admiration of this faceless street artist from Bristol. 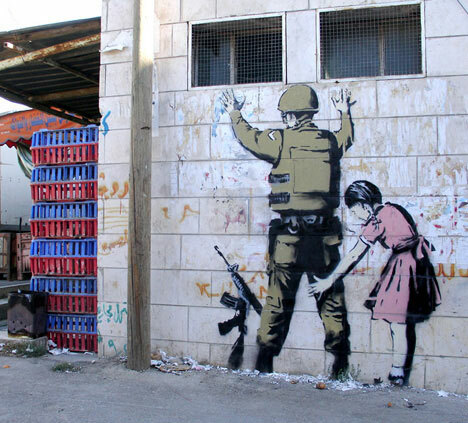 This is part five in our complete eight-part guide to Banksy Art and Graffiti. Curiosity about Banksy’s true identity has been growing among fans and detractors alike. Newspapers, magazines, and television stations have diligently tried to unmask him to no avail. Hordes of everyday people haunt the streets of London hoping to get a glimpse – and a snapshot – of the elusive artist. Although he’s extremely hard to spot, Banksy isn’t a hermit. On a very few occasions, he has granted interviews with the media. The interviewers themselves can’t even be sure that the man they’re speaking with is the real Banksy. They just have to take it on faith that the notorious prankster is telling them the truth for once. In this early Banksy interview from 2003, Guardian reporter Simon Hattenstone met up with Banksy at a pub in London. The conversation that followed covered everything from why he started using stencils to how much better it is to spend very little time making a piece of art than to slave over it. To this day, many quotes and sound bites attributed to Banksy are taken from that very interview. A more recent interview, erroneously labeled as the first interview with Banksy, seems to depict a slight more world-weary artist. He is forced to duck out of Leake Street, the location of 2008’s Cans Festival, before the interview is over due to mobbing media outside. 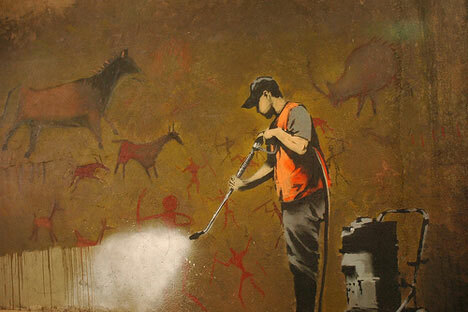 One of the more interesting Banksy interviews was with Paul Wood of BBC Radio 4. 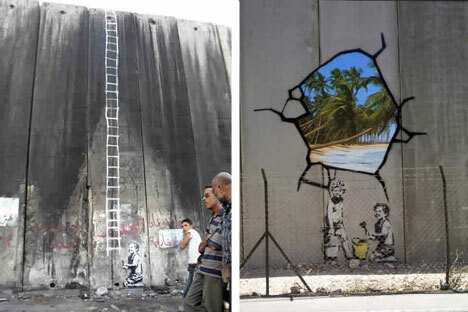 Banksy spoke with the interviewer after his trip to Palestine where he painted mural depicting freedom on the wall separating Palestine from Israel. Though there’s no way to be absolutely sure that it was really Banksy’s voice in that interview, it seems clear enough that the words were his. The notoriously subversive artist does seem to enjoy keeping a record of some of his unavoidably temporary pieces of art. Videos of Banksy painting or installing other works, always with his face obscured, have been passed around the internet for years. Since no one has ever snapped a picture of Banksy, let alone taken a video of him in action that shows his face, impostors abound on the Internet. 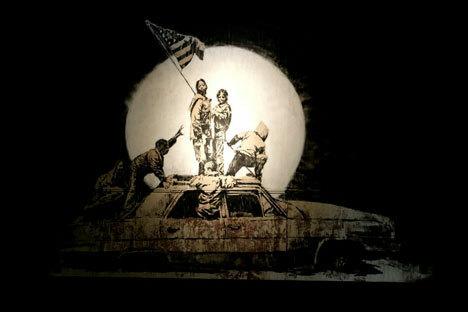 “Banksy unveiled” videos can be found in droves on YouTube. They range from the downright silly to the obviously faked to the type that really make you question whether they did film the right guy after all. Aside from all of the faked Banksy sightings, there are plenty of interesting videos about the artist. One of the most publicized is the Banksy mini-documentary from PickardTom. This short film (above) shows the reactions of several Londoners when asked what they think of the infamous street artist. Banksy’s website houses several videos related to his work; they are mostly news stories, but one in particular is a lot of fun to watch. The video above shows Banksy appearing on the street, spray painting on a blank space where a billboard would usually go, then blending back into the crowd as he walks off. We can only hope that the secretive Banksy will agree to further interviews in the future, as well as videotaped records of his artistic process. But as he has repeatedly said, the pictures speak for themselves. Banksy Art and Graffiti 1: Introduction – Who is Banksy?